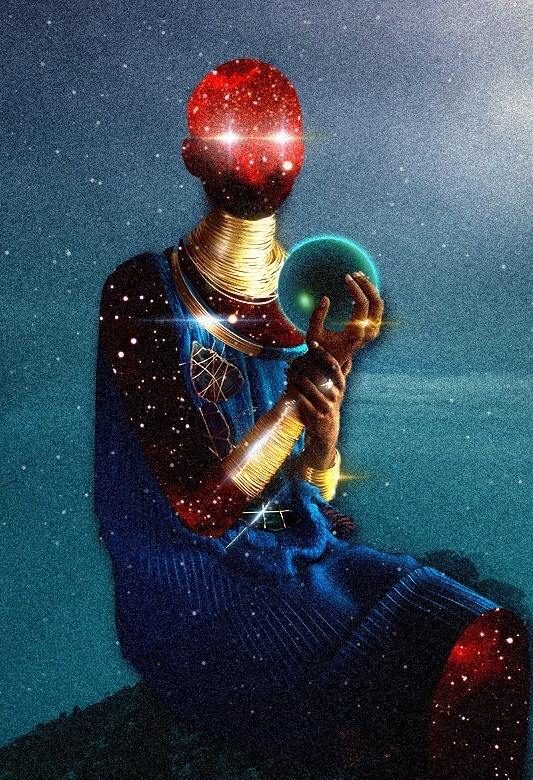 When the planet of communication (Mercury) combines energies with the planet of mysticism and illusions (Neptune) expect the need for creative and imaginative exploration to intensify. Mercury entered Scorpio on November 2nd ushering in a deep/probing urge to express ourselves passionately, and in some cases, with no words at all. Scorpio has the ability to tap into the deepest parts of the psyche (often telepathically) and when these gifts are merged with the universal longing of transcendence that Neptune provides, magic can certainly happen. Today I decided to work with two oracle decks for further insight into the Mercury/Neptune trine, what our central focus should be, and how we can use this energy constructively and to our benefit. The very first card is, Knowledge. Here we have a woman armed with books, scrolls and information (all very Mercurial in nature) This symbolizes our thought process. Mercury is very much a guide of souls. We are being encouraged to use our psychic gifts and intuition in order to make better decisions. While Neptune can often make the messages we receive blurry, it’s trine to Mercury creates a sense of inner knowing. 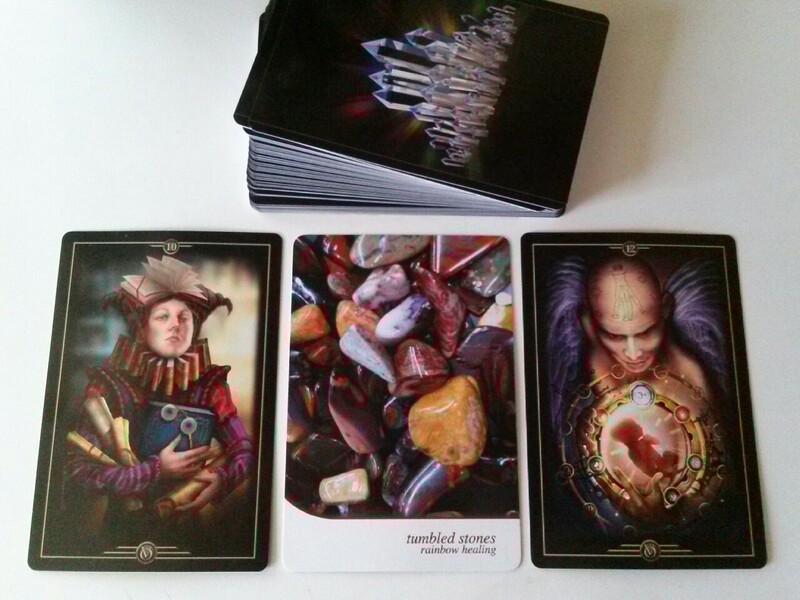 The Next Card is, Tumbled Stones. Here we have rainbow/universal healing. This ties in perfectly with Neptune’s desire to merge with the collective consciousness; blessings, healing and dreams should be our focus during this time. The final card is the, Wonder of creation. A seer/guardian angel watches closely over a new life forming in the center of an astrological chart. Neptune is very much a creative and artistic planet. Mysteries and the unknown are quite Neptunian as well. We need to understand that we are not alone in the universe. Pay close attention to your dreams/visions and signs. There’s valuable information that may be available to us. If possible, try to take some time to communicate (Mercury) with the spirit (Neptune) Pay especially close attention to your sixth sense; If possible marry the analytical and the spiritual. This entry was posted in Astrology, Oracle Cards, Planetary Trends and tagged Divination, Oracle Cards, Planetary Trends, Tarot Cards. This is an interesting little deck that isn’t so little. These cards were given to me as a gift and I was quite excited when I saw them. There aren’t many astrology-themed decks out there (at least not ones I like) so I was fascinated as I began to inspect the cards. The deck contains 90 cards and there are four sets of cards: Houses, Aspects, Signs and Planets. It can be a bit tedious to shuffle because each set of cards has to be shuffled separately before placing them down for a reading. Despite this small inconvenience, the deck is a joy to work with. The deck comes with a 96-page book that includes various spreads; from a Celtic cross spread to two different horary spreads, this deck has a little something for everyone. Some basic understanding of astrology helps when working with these cards, but the instruction book gives more than enough info for newbies. 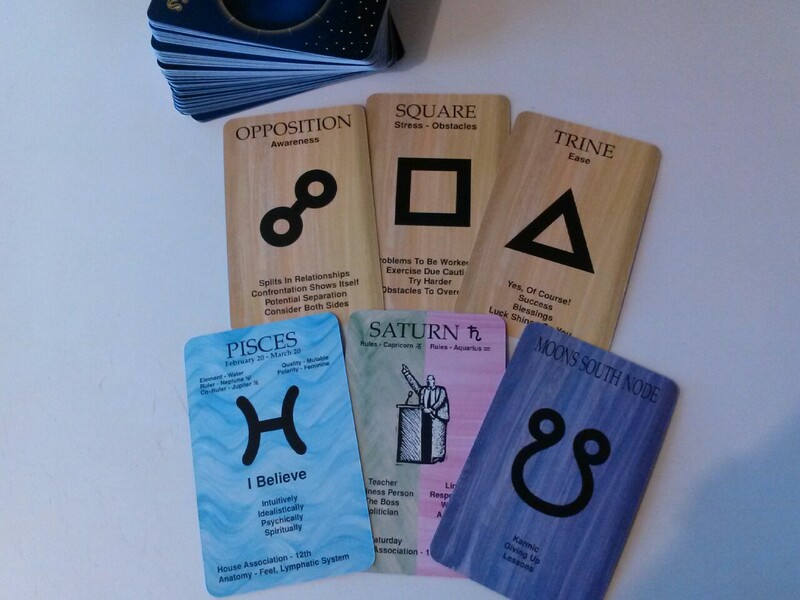 With it’s similarities to flash cards, this deck makes a wonderful learning tool to those new to astrology. This entry was posted in Divination, Oracle Cards and tagged Divination, Oracle Cards.